If you missed the Introduction or Part I, Part II or Part III of this Article, just click on the respective link. With the discovery of the “Caractors” photo in the Hicks Collection in December of 2012, we now know a little bit more about the “Caractors” document than we did before. Through an analysis of the handwriting found on the original (complete) document, it is possible to make some reasonable guesses about its origins, which I will provide below. There were a number of periods when Joseph Smith dictated or wrote the text of what became the Book of Mormon. The manuscript was written from the dictation of Joseph Smith by the following amanuenses: Oliver Cowdery, Emma Smith, wife of Joseph Smith; Christian Whitmer and Martin Harris, and it is supposed that Alva Hale was also employed as one of the scribes, but Hale only wrote a small portion. of the 144 pages of the Book of Mormon manuscript in the Church Historian’s Office, 124 pages are in the handwriting of Oliver Cowdery; eleven were probably written by John Whitmer; and twelve others are the work of an unidentified scribe. In a lecture given on February 26, 2013 titled “The Original and Printer’s Manuscript”, Royal Skousen proposed that the unknown scribes (from period 4) were Christian and John Whitmer. (The identification begins at the 31min mark). In analyzing the Hicks Photo two things become clear. The first is that if the Book of Mormon characters had been written first on a blank sheet of paper, then there would have been plenty of room for the copyist of those characters to transcribe all of the them without bunching them up, or making some of them smaller, because the characters are actually written at the top of the sheet. The second is that the phrase “The Book of the Generations of Adam” is from the Book of Moses. OT Manuscript 1, pg. 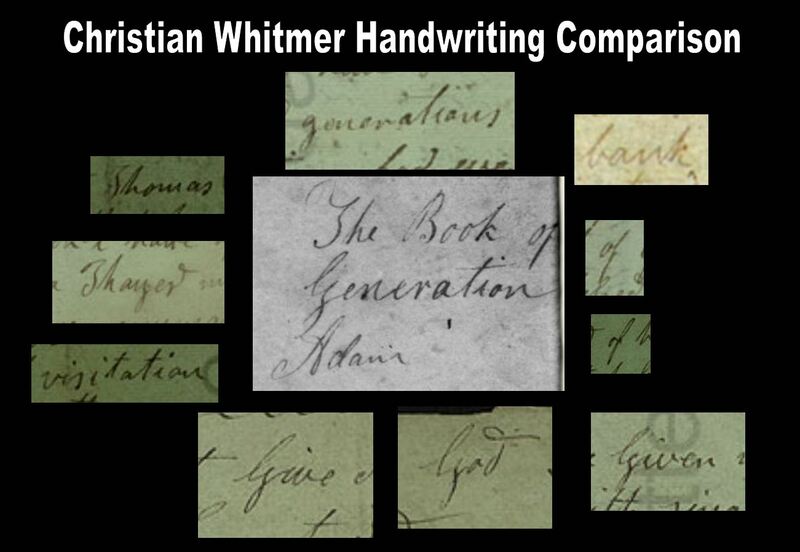 12, first appearance of the phrase “The Book of the generations of Adam” handwriting of John Whitmer, October 21, 1830. These two observations generate a lot of questions. Unfortunately there will never be any sure answers to some of them unless more discoveries come to light, so we can only make guesses or reasonable conclusions. The Book of Moses is part of the Joseph Smith New Translation (or revision), parts of which can be found on three manuscripts. The part of the Book of Moses that has the phrase the book of the generations of Adam was written between October and December of 1830, depending on the manuscript. When John Whitmer traveled for the first time to the Kirtland, Ohio, area in January 1831, Joseph Smith instructed him to “carry the commandments and revelations” with him. Among them was a manuscript copy of Joseph Smith’s new text of the early chapters of Genesis. The manuscript was a transcription, in Whitmer’s hand, of all of Joseph Smith’s Bible revision that had been produced to that point. It corresponded with Genesis 1B5 and with Moses 1:1B8:12 in the current Latter-day Saint Book of Moses. 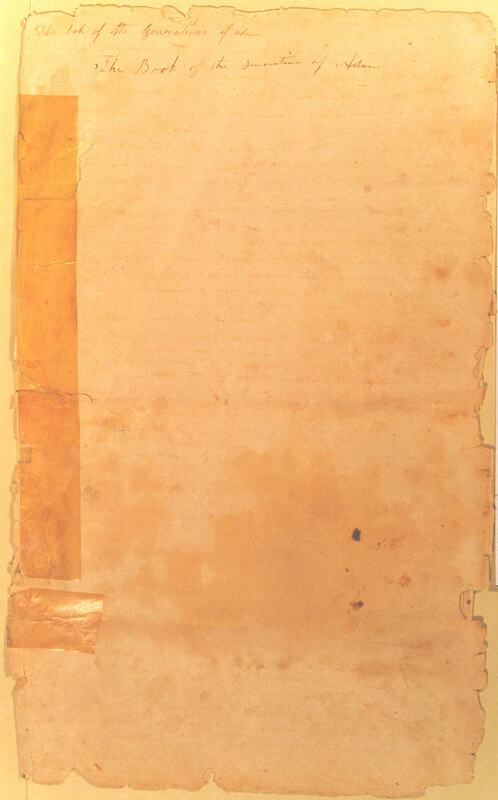 As you can see from the photos, the right hand side of OTMan3 is very frayed, as is the document in the Hicks photo. 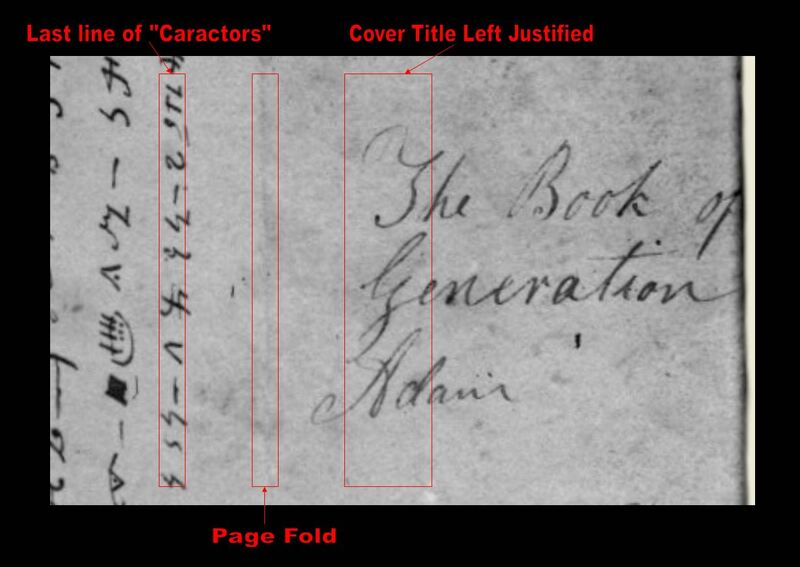 One possibility is that the document in the Hicks photo was a cover that had been made for John Whitmer’s OTMan3; and that perhaps while Whitmer was copying other documents he added the Book of Mormon characters also. Joseph initially misspells the word “character” (leaving out the “h”) in his 1832 History,, so it is possible that Joseph in 1829 may have misspelled the word when he prepared the original document, and then when John Whitmer copied it, he kept the original spelling. This witness [David Whitmer] describes the book as being something like 8 inches square; (our informant did not recollect precisely,) the leaves were plates of metal of a whitish yellow color, and of the thickness of tin plate; the back was secured with three small rings of the same metal, passing through each leaf in succession; — that the leaves were divided equi-distant, between the back & edge, by cutting the plates in two parts, and united again with solder, so that the front might be opened, as it were on a hinge, while the back part remained stationary and immovable and in this manner remained to him and the other witnesses a sealed book, which would not as yet be revealed for ages to come, and that event the prophet himself was not as yet permitted to understand. 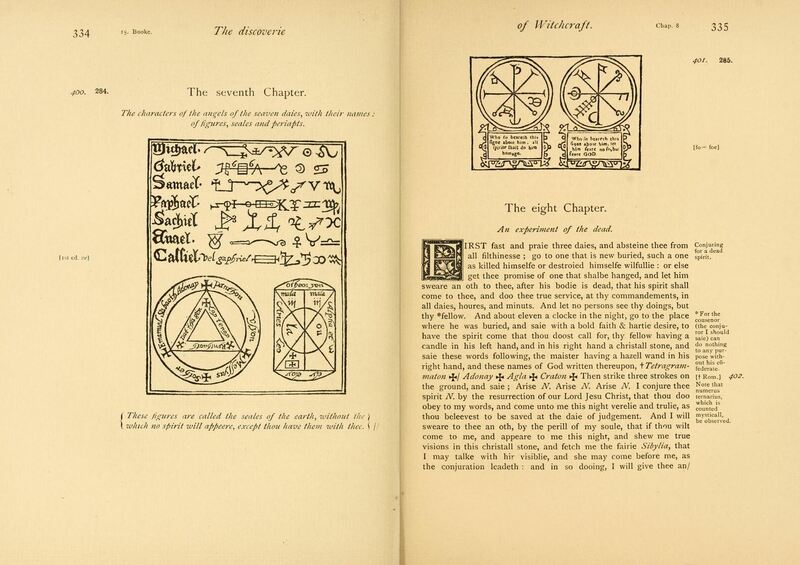 On opening that portion of the book which was not secured by the seals, he discovered inscribed on the aforesaid plates, divers and wonderful characters; some of the large and some small, but beyond the wisdom of man to understand without supernatural aid. It may be possible then, that the smaller characters were added in later, from the document that Joseph had finished which supposedly included both columns and concentric circles as described by Orasmus Turner and Charles Anthon. This scenario presupposes that Harris would have been showing a long piece of foolscap paper with only four lines of characters on it, which Joseph may have discarded because of mistakes in copying, and that later the other characters were added to it from the one taken to Charles Anthon, and then it was used as a cover for John Whitmer’s OTMan3. This scenario also seems very tenuous. These (of course) are only conjectures; but one thing is certain, Joseph had his own copy of the characters that he kept with him that he showed to various people until shortly before his death. a singular scrawl. It consisted of all kinds of crooked characters disposed in columns, and had evidently been prepared by some person who had before him at the time a book containing various alphabets. Greek and Hebrew letters, crosses and flourishes, Roman letters inverted or placed sideways, were arranged in perpendicular columns, and the whole ended in a rude delineation of a circle divided into various compartments, decked with various strange marks, and evidently copied after the Mexican Calender given by Humboldt, but copied in such a way as not to betray the source whence it was derived. This description seems to agree with the one made by Charles Anthon, but since Turner’s book was published long after the Anthon letters were written, there is a chance that he may have borrowed from them, but again, that seems very tenuous. As for the calendar that Anthon mentions, there are actually two calendars in Alexander Von Humbolt’s books, one called the “Calendrier Lunaire des Mayseas” or the Lunar Calendar of the Muiscas, who were an ancient people that inhabited the northern Andes in Columbia, Central America, and the other the more famous Aztec Sun Stone discovered in 1790 in Mexico City. Humboldt’s Mexican & Musica Calanders pp. 276, 104. In 1795, Dr Jose Domingo Duquesne, a priest of the church of Gachancipa in Columbia published a paper detailing the Muisca calendar, which information he claimed to have received from the Indians themselves. His paper was later ridiculed as being nothing but an invention of his. 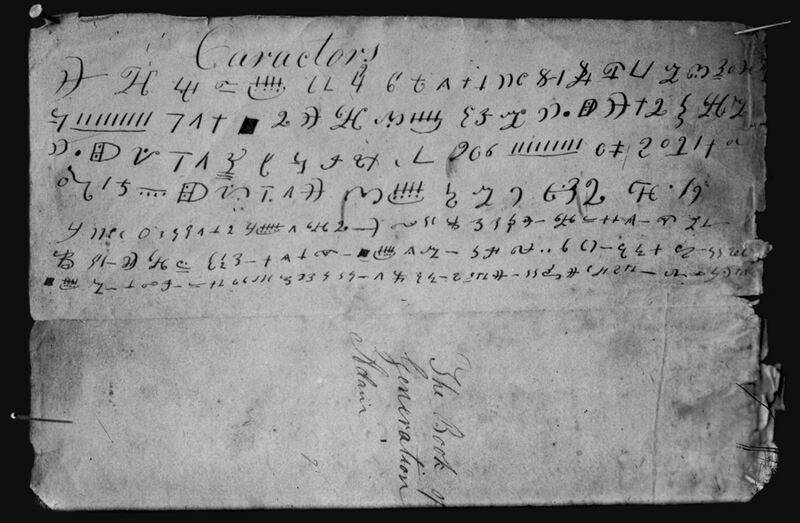 In his description of the Muisca numbers, father Duquesne says that they used written signs to denote them, and gives a plate showing the graphic symbols for each name and number. Joseph Smith was familiar with this work and published an article in 1842 in the Times and Seasons titled ““Traits of the Mosaic History, Found among the Aztaeca Nations,” which quoted from Humboldt’s books. At the lower right quadrant of the “Holiness to the Lord” lamen is an emblem of five points and seven internal spaces that combines the Jehovah (JHVH) “Tetragrammaton” with “Adonay”. Whoever put this symbol on the “Holiness to the Lord” lamen incorrectly drew it with seven internal compartments, for as early as 1656, an English translation of Paracelsus’ writings specified that the figure should have “six spaces, and outwardly five angles, wherein are written five syllables of the supreme name of God; to wit, Tetragrammaton” . 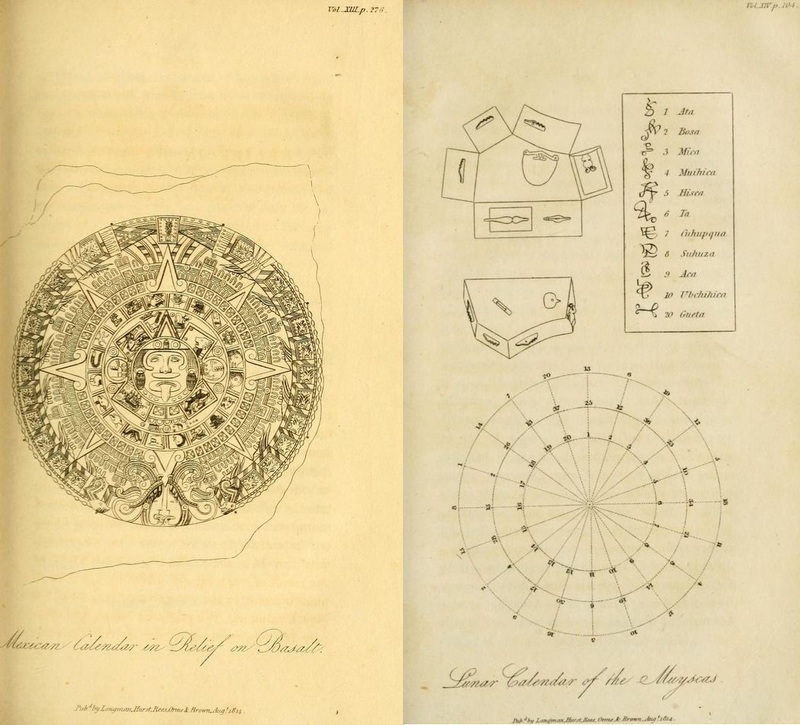 One could describe the Smith lamans as drawn, rudely and bunglingly, with concentric circles, between, above, and below”, which were “divided into various compartments, [and] decked with various strange marks, to quote Anthon and Turner. Another possible scenario is that Joseph gave Martin a document in the fall of 1827 with only four lines of characters on it. Harris took this to John Clark, which according to Lucy Smith were copied by his future son-in-law Flanders Dyke at the behest of his wife Lucy Harris. 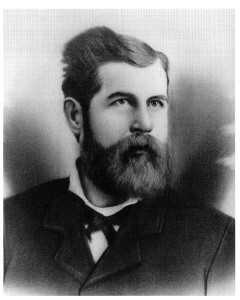 Reuben Hale supposedly later helped Joseph prepare the transcript that was to be presented to Charles Anthon and Samuel L. Mitchill which would have included more of the characters. Then, when Martin Harris returned to Harmony, Pennsylvania, three additional lines of characters were added to the first copy, written smaller than the first four lines. A few years later in 1831, John Whitmer made an exact copy of that document, while Joseph Smith kept the original; which he subsequently showed to various people in Kirtland and Nauvoo, from which the 1844 broadside characters were copied. If Joseph did place the transcript shown to Anthon with the Book of Mormon manuscript in the cornerstone of the Nauvoo House in 1841, then he would have been left with a copy of the characters that was almost exactly like the Whitmer copy, and from which the 1844 Stick of Joseph Broadside was produced. These are of course conjectures that may or may not bear out in the light of further discoveries. These “stand alone” dash like characters do not appear to be found on the first four lines of the larger drawn characters. Perhaps these smaller groups of characters were originally within the concentric circles (the two larger groups around the outside or inside edges) or were in vertical columns on the document taken to Anthon, and the dashes were inserted to separate them. These are intriguing possibilities, and perhaps someone will someday see a pattern in the numbers. It does though, seem hard to believe that this document is one that took Joseph “a whole week to copy” as David Whitmer later recalled, but it must also be remembered that Whitmer was prone to exaggerate and that he clung tenaciously to his erroneous testimony that he had both the Original Manuscript and the original Anthon Transcript . It is very clear though, from analyzing the Hicks photo, that whoever copied the document would have had plenty of room to enlarge the bottom four lines of characters or copy more of them (if there were more), even if the document had already been folded, but only if the characters were drawn before the Cover Title. During my study of the photo below, I noticed that the Cover Title was not written out in one line, but in three, and that it is “left justified”. This may indicate that the “Caractors” portion of the document was written first, or that the paper was folded before the Cover Title was written and Christian used the fold to the left to justify the Title. If the Cover Title was written before the “caractors”, then why not just write the Title across the entire page? This (to me) is a good indicator that the Cover Title and the “Caractors” were written after the page was folded in an effort to fit them in between the folds. Would someone who thought those characters so important to copy and keep – only copy some of them? And why wasn’t the document that Harris took to Anthon reproduced in it’s entirety? Was Whitmer directed not to reproduce the circles? If so, why? Or did Joseph (by 1831) only have a copy of the Book of Mormon characters that looked like the one that Whitmer copied? If so, what happened to the “Anthon Transcript”? Was it the copy that Harris took to New York that Flanders Dyke made a copy of? If so, was Joseph leery of keeping the original “Anthon Transcript” for the same reason that he did not “retranslate” the 116 pages of the Book of Mormon that were lost by Martin Harris? Could Joseph have produced another copy of the characters after this that were entirely different from the ones that Harris took to Anthon to thwart the designs of Lucy Harris? This line of thought brings to mind what Anthon himself said, that the copy that he saw was “evidently copied after the Mexican Calender given by Humboldt, but copied in such a way as not to betray the source whence it was derived.” If this criticism was related to Joseph by Martin Harris, perhaps Joseph destroyed the document, or entombed it with the Original Manuscript to avoid having to answer such criticisms. Perhaps in the light of facing such criticism, (and the problems he might encounter because of the Flanders Dyke copy) Joseph made another copy with the changed format and absence of concentric circles and other symbols. Also, if the ‘Caractors’ document had been folded, it would have been newly folded and so it probably would have been easy to write over the fold and include more characters if there were any – if it was created before the Cover Title had been written. One thing that lends credence to the theory that this document was created in 1831 or later is the handwriting on the document itself. For many years those who only could analyze the top portion of the document have speculated about who may have written it. 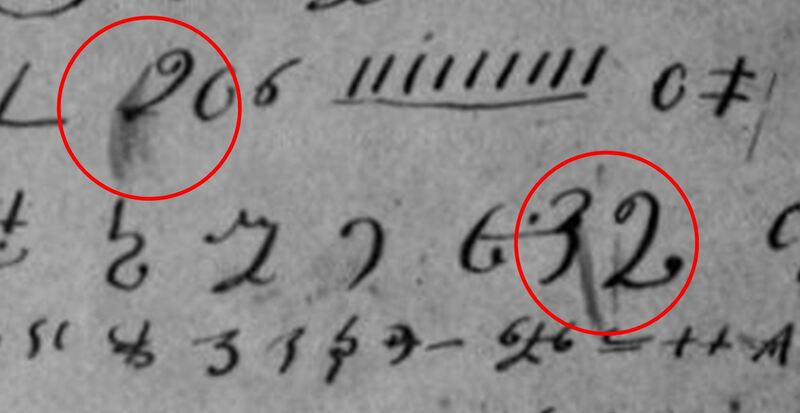 Some, like Dean Jessee, thought it might have been Joseph Smith’s handwriting, possibly because of the spelling of the word “Caractors” which was initially misspelled by Joseph in his Summer 1832 History. Others thought it might have been John Whitmer who wrote the word. With the publication of the Book of Mormon Original Manuscript pages and other items in the Church of Christ Archives, I believe I can identify the handwriting on the document. As I mentioned above, Royal Skousen identifies the two unknown Book of Mormon scribes from the Original Manuscript as John and Christian Whitmer. Since there is a large body of evidence which identifies John Whitmer as one of the scribes, I will focus here on identifying the other one. Christian Whitmer Marriage Notice, Geneva Gazette, March 9, 1825, which misspells his name as “Wilmer” instead of “Witmer”. Christian Whitmer was born on January 18, 1879, in Pennsylvania, and was the oldest son of Peter Whitmer Sr. and Mary Musselman Whitmer. Christian moved from Pennsylvania to Seneca County New York, and in 1825 he married Anna Schott and took of the trade of shoe making. In that same year Christian joined the New York State Militia and received the commission of an Ensign with the 102 Regiment of the Seneca County Grenadiers. His brother-in-law, Daniel Schott was made a Captain of the same Regiment a few days earlier. Christian’s brother David Whitmer would join the Grenadiers a month later as a Sargent. Before I knew Joseph, I had heard about him and the plates from persons who declared they knew he had them, and swore they would get them from him. When Oliver Cowdery went to Pennsylvania, he promised to write me what he should learn about these matters, which he did. He wrote me that Joseph had told him his (Oliver’s) secret thoughts, and all he had meditated about going to see him, which no man on earth knew, as he supposed, but himself, and so he stopped to write for Joseph. When George Q. Cannon visited David Whitmer in 1884 he reported that David told him that his brother “Christian” was one of those “who assisted the Prophet Joseph” in transcribing what was dictated by Joseph. 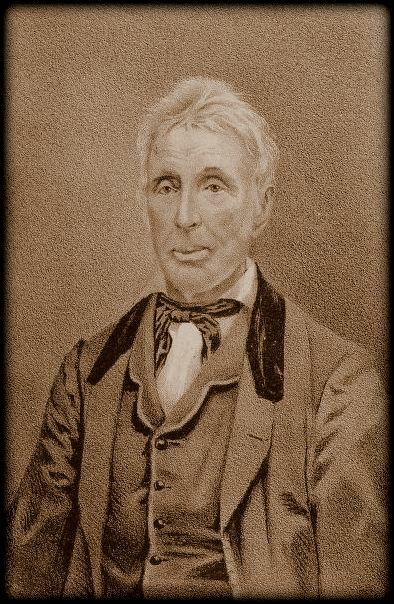 Christian Whitmer and his wife Anna were baptized on April 11, 1830 according to Joseph’s 1839 History, just a few days after the organization of the church. When Hiram Page was receiving “revelations” through a peep stone like Joseph did, the whole Whitmer family and Oliver Cowdery believed the revelations were of God. Joseph later declared them to be of Satan  and according to Joseph’s account of the matter it was Christian Whitmer that helped convince the others to side with Joseph in the matter. As I mentioned above, there are many examples of John Whitmer’s handwriting and so it is relatively easy to identify him as Unknown Scribe 1. 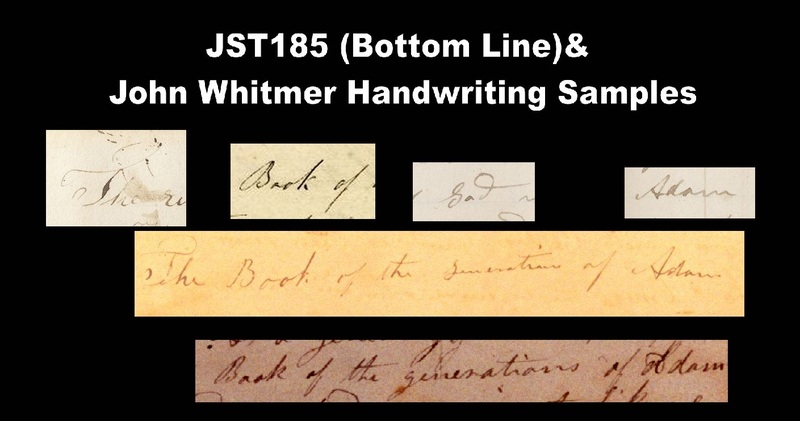 Identifying Unknown Scribe 2 has been a bit more difficult because that handwriting is very similar to John Whitmer’s handwriting; and there are few known samples of Christian Whitmer’s handwriting. 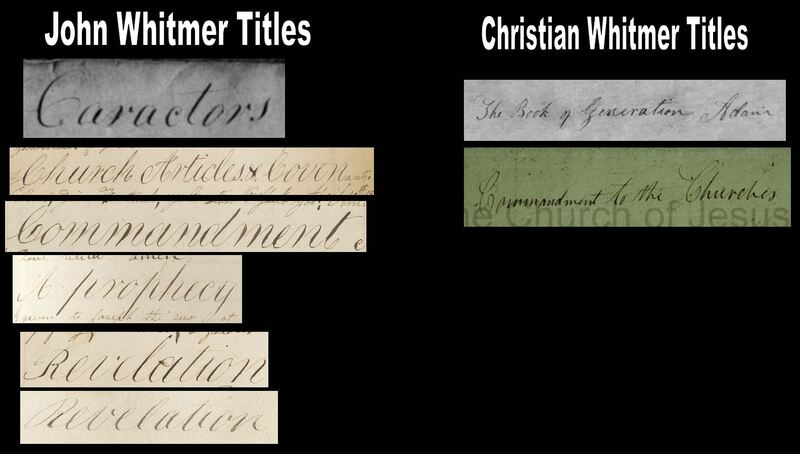 Still, the signature of Christian Whitmer from 1825 has some striking similarities with Unknown Scribe 2. It is immediately apparent that Christian Whitmer has some common style characteristics in his signature that John Whitmer does not. For example, his ‘s’ is very elongated in his signature, he makes his “i” and “t” stand alone, and there are other unique style characteristics documented in the photo above. 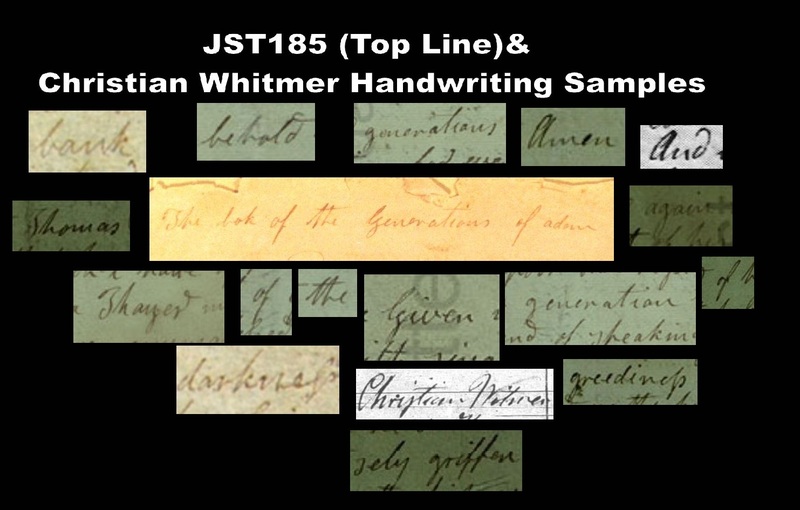 Though John Whitmer has some of them, and used some of them in his handwriting, (like the elongated first “s” in his double “s” combos), he does not consistently do so as Christian Whitmer does. 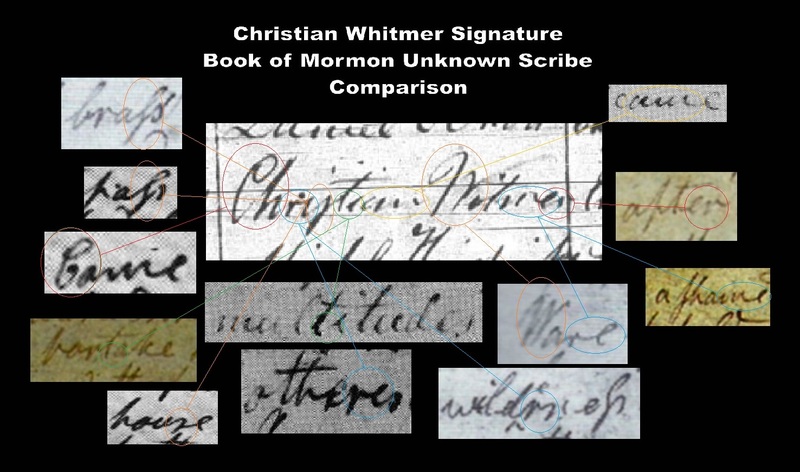 I am therefore very confident that the unknown scribe’s handwriting from the Book of Mormon (sampled above) is that of Christian Whitmer, and that using those handwriting samples, Christian can also be identified as the author of various “revelations” authored by Joseph Smith and the Cover Title for OTMan3. In the current issue of Mormon Historical Studies, Michael Hubbard Mackay, Gerrit J. Dirkmaat, and Robin Scott Jensen have concluded that the entire document was written by John Whitmer. 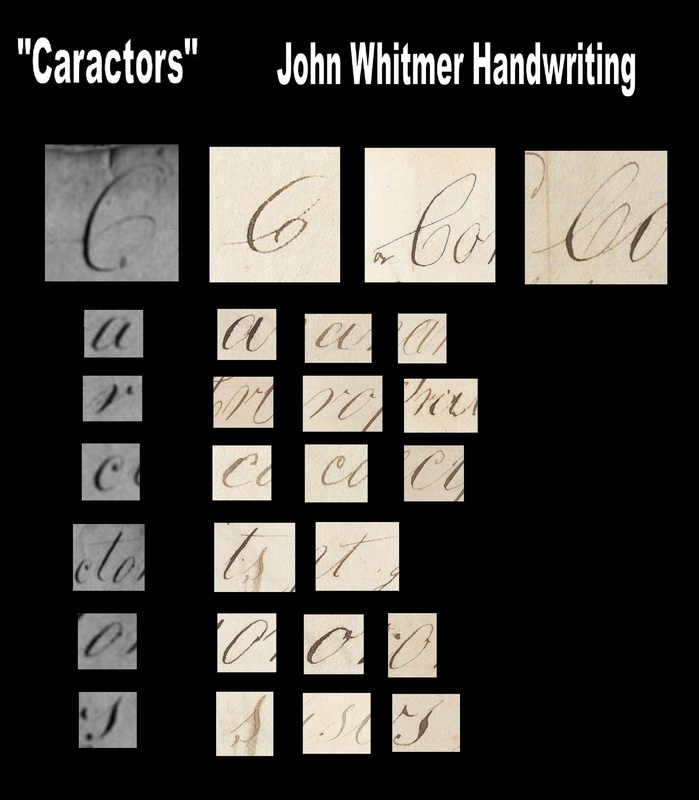 John Whitmer’s Handwriting compared with “Caractors” Document. Samples Taken from Revelation Book 1. Since the bottom half of the document is not extant, no ink tests can be done, and therefore it is impossible to determine if the entire document was written at the same time. We must therefore rely on handwriting analysis for the portion of the document which contains the Cover Title, “The Book of The Generations of Adam”. It is here where I diverge with Mackay, Dirkmatt and Jensen. When I first studied the handwriting on the Hicks photo, I thought the entire document was written by John Whitmer. The reason I thought so, was because John Whitmer always writes his capital “A” in the traditional way. Christian, on the other hand, always makes his capital “A” as a large lowercase “a”. But a document in the Community of Christ archives, (JST185) has helped to clarify this important distinction between John and his brother Christian and provide a scenario that explains my two authorship theory. But there was another problem with identifying John Whitmer as the person who wrote “The Book of the Generations of Adam” on the “Caractors” document, which has to do with the style characteristics of the capital “G”. In all of the samples of John Whitmer’s handwriting, he never makes his capital “G” in the same way it appears on the “Caractors” document. But Christian Whitmer does, very consistently. I was helped in my identification of the handwriting by a number of documents from the Community of Christ archives supplied by H. Michael Marquardt via Dan Vogel, who was kind enough to provide them when I asked him for anything written by the Whitmer brothers or unknown scribes that could be one of the Whitmers. I believe that John asked Christian to write the cover for OTMan3. This document (pictured above) is (I believe) the Title chosen for the cover that John Whitmer asked his brother Christian to write for OTMan3, which Christian then wrote down on this sheet of paper. The top line is written by Christian, and below that is what I believe is the corrected way that John wanted it written. The handwriting on the top line matches the handwriting of the same phrase on the “Caractors” document, while the bottom line does not, but that line does match John’s handwriting from other documents. John’s capital “T” has a distinct style characteristic which is different from Christian’s, and John does not make his capital “G” in quite the same way as the person who wrote the top line. Why did John ask Christian to write the Title for the cover of his manuscript? That remains a mystery. Perhaps he was busy with other projects and so assigned this task to his brother. But I believe that both of them contributed to the document because the similarities between John’s handwriting and the word “Caractors” are significant, and John’s handwriting can’t be matched to the sentence “The Book of the Generations of Adam” that appears below (or to the right of depending on how the page is displayed) the Book of Mormon characters. Also, When Christian wrote Titles to documents, they look nothing like the “Caractors” Line, but John Whitmer’s title lines do. If the document was entirely written by Christian Whitmer, then why are the style characteristics of the two title lines (“Caractors” and “The Book of the Generations of Adam”) so different? After Christian wrote the Cover Title, John most likely added the “Caractors” which he copied from another document to the Cover of OTMan3 so that he would have them with his personal manuscript of the Book of Moses. I believe that this was done hurriedly and on impulse by John, to preserve a copy of the “caractors” before the move to Ohio. This seems, to me, like the most likely scenario, because the word “Caractors” is more like the style of John Whitmer’s writing, and they seem to have been made to fit in the section above the first fold of the document. Also, Christian Whitmer’s Cover Title was justified to fit between the folds of the document, and so the manuscript was probably already folded into fourths, and the Cover Title was positioned in a way to display it within the middle fold – as was done with a later “revelation” penned by Christian Whitmer which he titled “Commandment to the Churches”. (See picture of June 15, 1831 “revelation” below). But why would John Whitmer put the characters there, on the cover, when he had a whole blank sheet of paper that only had two sentences on it (The book of the generations of Adam), which could have easily been flipped over and used, and then inserted inside the manuscript? It may well be that the “Caractors” part of the document was made first, and then the title was added. The smaller characters may have been copied smaller because that was the way they appeared on the document that John Whitmer was copying. I find this scenario less likely, and only present it as a possibility. If you look closely as JST 185, (click to enlarge) you can see some faint writing that looks like it was transferred (from being kept together) from another document. H. Michael Marquardt was told by Rachel Killebrew (the Librarian at the Church of Christ) that this has been identified by Brent Metcalfe as the January 2, 1831 “revelation” that is now Doctrine and Covenants Section 38. The flip side of this “unnumbered flyleaf” (as it is catalogued by the COC) is completely blank. “* * * To give particulars of the Mormon excitement of 1831 would require a volume — a few words must suffice. It has been stated that from the year 1815 to 1835, a period of twenty years, ‘all sorts of doctrine by all sorts of preachers had been plead;’ and most of the people of Hiram had been disposed to turn out and hear. This went by the specious name of ‘liberal.’ The Mormons in Kirtland, being informed of this peculiar state of things, were soon prepared for the onset. “In the winter of 1831 Joseph Smith, with others, had an appointment in the south school-house, in Hiram. Such was the apparent piety, sincerity and humility of the speakers, that many of the hearers were greatly affected, and thought it impossible that such preachers should lie in wait to deceive. “During the next spring and summer several converts were made, and their success seemed to indicate an immediate triumph in Hiram. But when they went to Missouri to lay the foundation of the splendid city of Zion, and also of the temple, they left their papers behind. This gave their new converts an opportunity to become acquainted with the internal arrangement of their church, which revealed to them the horrid fact that a plot was laid to take their property from them and place it under the control of Joseph Smith the prophet. This was too much for the Hiramites, and they left the Mormonites faster than they had ever joined them, and by fall the Mormon church in Hiram was a very lean concern. 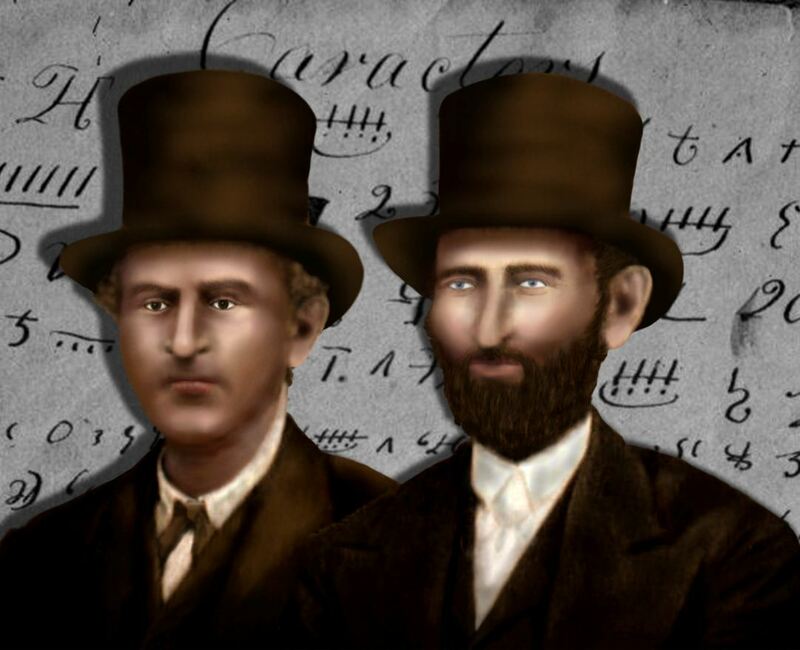 “But some who had been the dupes of this deception, determined not to let it pass with impunity; and, accordingly, a company was formed of citizens from Shalersville, Garrettsville, and Hiram, in March, 1832, and proceeded to headquarters in the darkness of night, and took Smith and Rigdon from their beds, and tarred and feathered them both, and let them go. This had the desired effect, which was to get rid of them. They soon left for Kirtland. “All who continued with the Mormons, and had any property, lost all; among whom was John Johnson, one of our most worthy men; also, Esq. Snow, of Mantua, who lost two or three thousand dollars. Ryder was in Kirtland on June 6, 1831, when he was ordained an elder by Joseph Smith. Two weeks after Symonds’s ordination, the Prophet, accompanied by many of the leading brethren in Ohio, departed from Kirtland on their ﬁrst visit to Independence, Jackson County, Missouri—the site of the prophesied city of the New Jerusalem and the land designated as Zion. Allegedly, with the Church leaders away, Symonds Ryder traveled north from his farm in Hiram, Ohio, up to the Church headquarters in Kirtland. Somehow, without being discovered, he accessed the Church records. Symonds apparently knew what he was looking for. He secured a certain group of manuscript revelations. The documents he took detailed, in one way or another, the organization, procedures, or laws of the Church. Included in these materials was Oliver Cowdery’s 1829 Articles. Ironically, also among the manuscripts was a copy of the revelation in which Ryder’s name was misspelled. More than 125 years later, in 1958, Symonds Ryder’s descendants discovered these manuscript revelations tightly rolled up in a linen handkerchief inside the drawer of a dresser that had been in the Ryder family for many years. The family believes that Ryder himself hid these documents for unknown reasons and they remained untouched until being discovered in 1958. It was his great-great-granddaughter who unrolled the precious old documents and ﬂattened them in books. 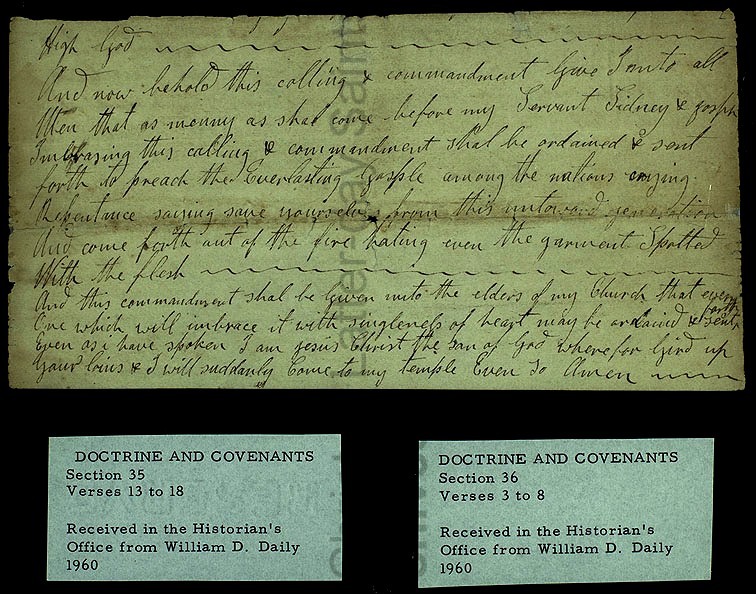 Two years later, the Ryder family, assisted by a Latter-day Saint family living in the community of Ravenna, Ohio, forwarded these priceless historical revelation documents to the Church historian in Salt Lake City. June 15, 1831 “Revelation” (D&C 56) Handwriting of Christian Whitmer and the cover title for this document, made to fit after it was folded. Using these “revelations” that have now been identified as having been written by Christian Whitmer, one can see that they are the same handwriting as the Cover Title for John’s OTMan3. “…a recent discovery has helped clarify the format and content of the original “Caractors” document and provides a more likely time frame for its creation. 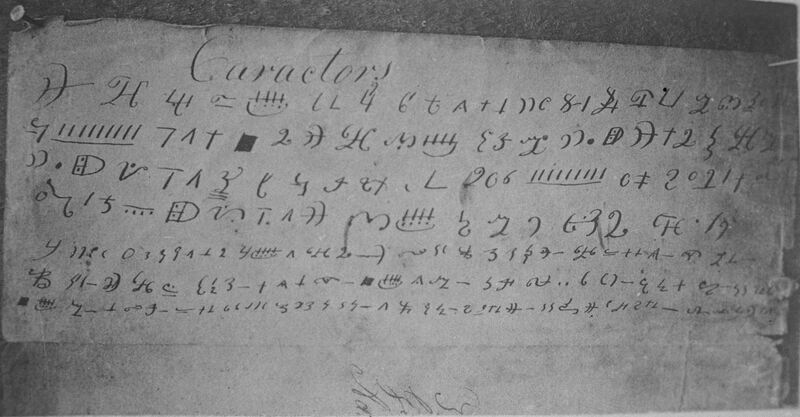 Sometime before early 1886, a photographer from Clay County, Missouri, Jacob T. Hicks, photographed the “Caractors” manuscript in David Whitmer’s possession. 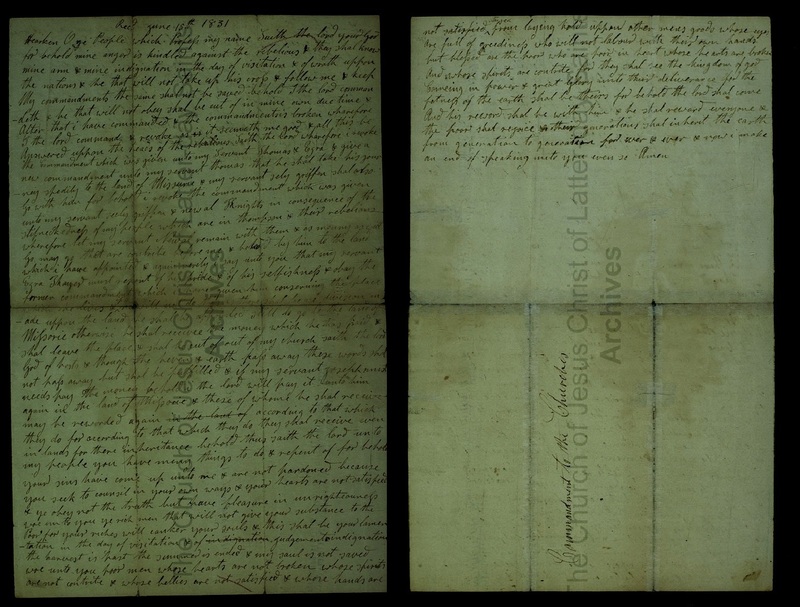 His photograph reveals that the currently extant portion of the document is only between one-fourth or one-third the size of the original document it was once attached to. …The 1886 image opens the possibility that the copies of the characters were written onto the document as a secondary thought and that the original document had a completely different purpose initially than to capture a copy of the characters. Reporter called. She would not admit him. Shut the door in his face. Wrote an article saying David Whitmer died in his arms. Mrs. Josephine [Helen Schweich] Van Cleave lives in Springfield, Illinois. Josie, her daughter, has the trunk the manuscript was kept in. Mrs. Van Cleave’s mother is a relative of Lew Wallace, who wrote Ben Hur. The characters that Martin Harris took to Professor Anthon of New York were with the manuscript. Once, Father WHitmer had not looked at the manuscript for a long time, and when they opened the trunk, found it was mouldy. But on examining the manuscript, it was not mold. Tied with the same yarn strings for years. 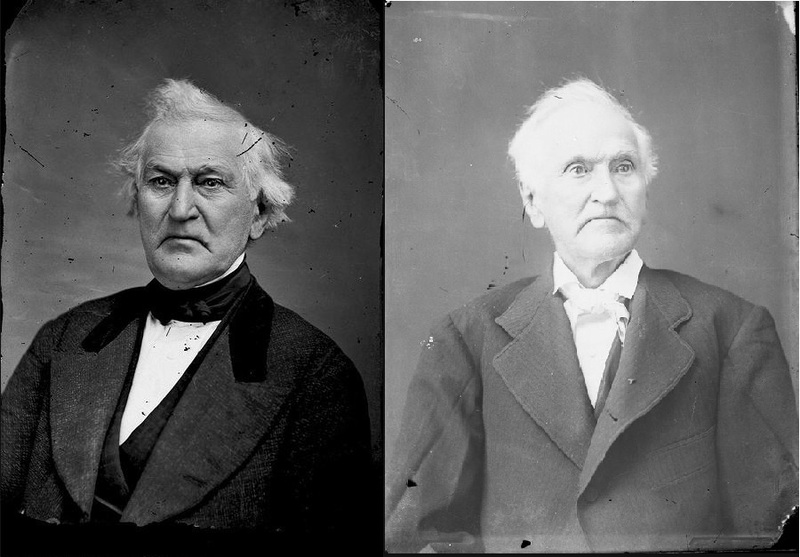 Mackay, Dirkmatt and Jensen seem to be unaware that David Whitmer sat for two portraits by Jacob Hicks, one in 1867 when he was mayor and the other probably between 1880 and 1882, as you can see below, and so the document could have been photographed anytime during that period, but was most certainly not photographed by Hicks after 1884. Why? Because there are witnesses who, well before 1886, attest that the “Caractors” document was the same size when they examined it as it is today, about 3 1/4 inches by 8 inches. John Whitmer was in possession of copies from the plates with the translation below, and showed that to me, and also of other valuable records. Two things about these statements are striking. David doesn’t relate the later claim that the characters were the original paper that Martin Harris took to Professor Anthon. If there were more than one character document in possession of the Whitmers as some have speculated, why didn’t David show him his document? David instead tells Poulson that “we copied some” (of the characters), and links them with an “old manuscript”. He then says that John could show him “some of the old manuscript”. What manuscript? Perhaps it was OTMan3, which had the copy of the characters David spoke of written on the wrapper. If Poulson saw that, he would have seen the phrase “The Book of the Generations of Adam” which he could have mistaken for a “translation below”, and which he may have concluded was continued in the short manuscript of less than 20 pages. David Whitmer had told others that just one character could generate a whole sentence or more of translation material, and this may also have been related by Whitmer to Poulson. The evidence does not bear out that this was David’s manuscript that he “loaned” to John. It was John’s manuscript, written in his own hand. 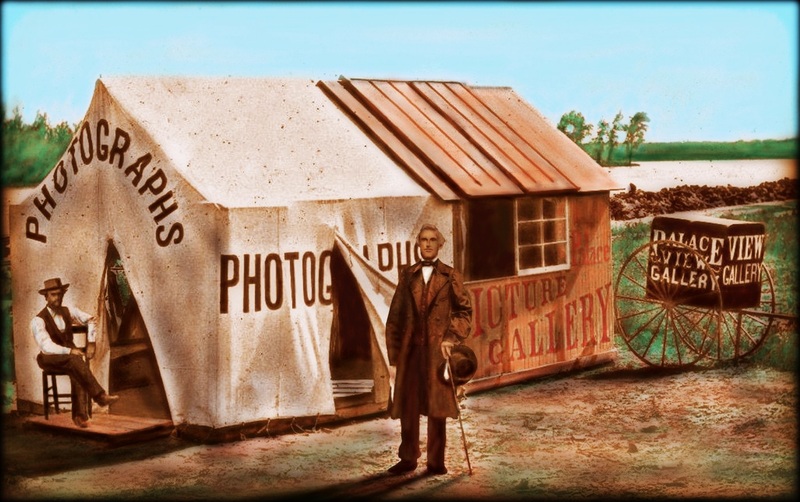 It may be that John loaned the wrapper to David for a brief time and that David had Jacob Hicks take a photo of it when he posed for his portrait in 1867. David then returned the wrapper to John, but still thought of it as his. It was quite the feather in his cap to have both the Original Manuscript to the Book of Mormon and the original transcript of the “Caractors” in his possession, and David stuck to this story for the rest of his life, even when faced with evidence from the Utah Mormons that this was incorrect, and knowing that his copy of the characters was not the original. It may have been the reason that the document was cut, to give David’s story more credibility. John may have also promised his papers to David, as the new head of the church (Church of Christ) they had established in 1876. But why cut the document when it would be very easy to just explain that they were not a translation of the characters? Perhaps because Whitmer had started telling others that he had the original “Anthon Transcript” and he did not want to change his story, or have others (like Joseph F. Smith and Orson Pratt did) claim that because it was only a copy, it was less valuable than an original. It certainly must have been frustrating to Whitmer to have the Utah Mormons come to Missouri, correct him, and then devalue his Printer’s Copy of the Book of Mormon manuscript as they did in 1878. It looks as if Hicks tried to focus on the characters themselves in this photo, (perhaps at the behest of David Whitmer) but still got some of the Manuscript Cover Title in the picture. This photo is centered better, but it is darker and some of the characters on the right edge are hard to see. It is impossible to know in what order the two photos were taken. There is also the possibility that David actually believed that Joseph Smith had authored the “Caractor” portion of the document and that it was taken to Anthon, but if this is so, why did he tell Poulson that “we copied some of them”, and how could Whitmer reconcile his copy to the description that Anthon gave of the transcript shown to him by Martin Harris, of which David was well aware of and had quoted in his Address to All Believers In Christ? David Whitmer’s own knowledge about the “Anthon Incident” and his penchant for exaggeration discredit his later statements about the “Caractors” document and give credence to the theory that he cut the document to bolster those later statements. Understanding the history behind the characters supposedly copied from the gold plates that Joseph Smith claimed to have found in the fall of 1827 has been difficult, but also of great importance to many. This was well understood by Mark Hoffman who created his famous forgery of the “Anthon Transcript” in 1980. For almost two centuries historians have been trying to add pieces to the puzzle of historical accounts left behind; and discover more evidence that will bring answers to the many questions that still linger about the “Caractors” that Jospeh Smith claimed were “Reformed Egyptian” writing. We now know that the document that was in the possession of John and David Whitmer was not the original transcript that was taken to Charles Anthon in 1828 by Martin Harris, but that it was a copy made by John and Christian Whitmer a few years later. What we still don’t know is what happened to the original “Anthon Transcript”, or some of the other copies that are mentioned in various accounts during the lifetime of Joseph Smith, and how they relate to the reproductions produced after his death. The Hicks Photos are important pieces of evidence that answer some of those questions; but as with other discoveries generate even more. 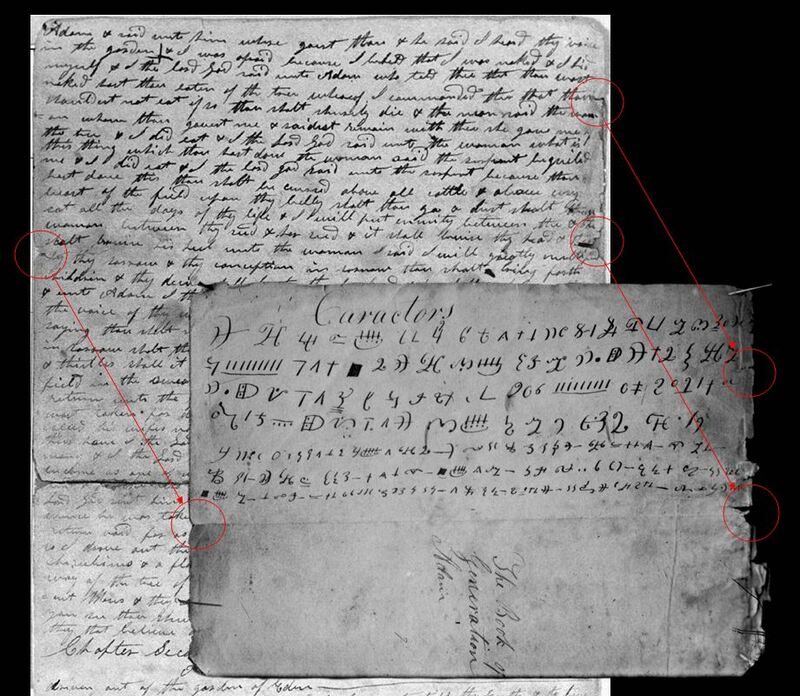 Still, finds like this one give hope to future historians that answers can be found, and that more discoveries are still out there waiting to be uncovered by diligent researchers and students of Mormon History. Online here, accessed August 30, 2013. Q. Who were scribes for father when translating the Book of Mormon? A. Myself, Oliver Cowdery, Martin Harris, and my brother, Reuben Hale. Q. Was Alva Hale one? A. I think not. He may have written some; but if he did, I do not remember it.… (Dan Vogel, Early Mormon Documents, p. 541). History of the Church, 1:49. Dean C. Jessee, “The Original Book of Mormon Manuscript,” Brigham Young University Studies, 10:3, Spring 1970, page 276. Royal Skousen, “The Original and Printer’s Manuscripts” (Book of Lecture, 1 of 3), The Maxwell Institute YouTube Page, published on July 17, 2013. Online here, accessed August 20, 2013. H. Michael Marquardt, “John Whitmer and the Revelations of Joseph Smith”, Web Version © 2009 by H. Michael Marquardt, Online here, accessed August 20, 2013. Kent P. Jackson, “The Sword of My Indignation”: John Whitmer’s Genesis Manuscript and 1861 Revelation, Mormon Historical Studies, Spring 2008, page 119. Online here, (PDF), accessed August 30, 2013. Revelation Book 1, page 11, Online here, accessed August 30, 2013. For more on the spelling issue and its possible ramifications about who may have authored the document, see note #259. 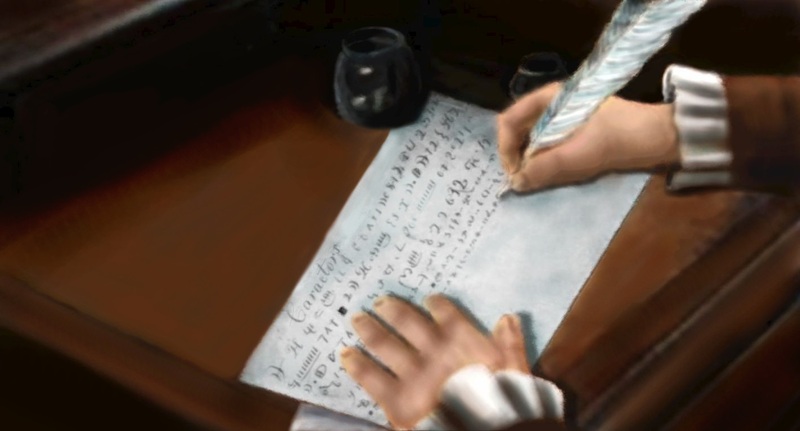 Note: at this time we were discussing possible scenarios for the authorship of the document before all of the handwriting samples were analyzed; therefore it doesn’t mean that Dan thinks that Joseph authored the document. See “The ‘Caractors’ Document: New Light on an Early Transcription of the Book of Mormon Characters, by Michael Hubbard MacKay, Gerrit J. Dirkmatt, and Robin Scott Jensen, Mormon Historical Studies, Vol. 14, No. 1, Spring 2013, pp. 140-141. “Gold Bible No. 6”, The Reflector, Palmyra, New York, March 19, 1831. Gleanings by the Way, p. 227. Joseph whispered and told me either to put the r[ecords] of K[ingdom] into the hands of some faithful man and send them away, or burn them, or bury them. I concluded to bury them, which I did immediately on my return home. (George D. Smith, An Intimate Chronicle; The Journals of William Clayton, p.135, June 22, 1844). The next day, Clayton recorded that “ I went to Joseph and got all the public and private records together and buried them.” (ibid, June 23, 1844). 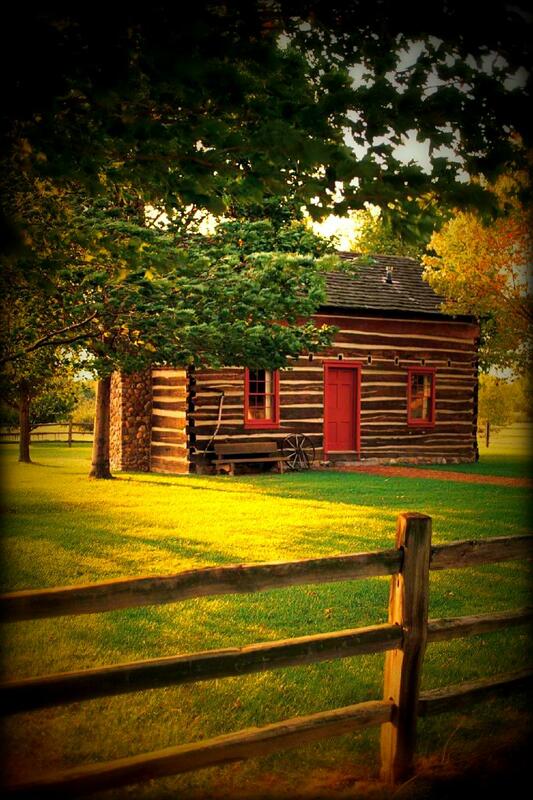 The foundation [of the Nauvoo House] was prepared, and the ceremony of laying the corner stone was attended to on the 2nd day of October, 1841. One thing transpired on that occasion worthy of note. After the brethren had assembled at the southeast corner of the foundation, where the corner stone was to be laid, President Joseph Smith said: ‘Wait, brethren, I have a document I wish to put in that stone,’ and started for his house, which was only a few rods away, across Main Street. I went with him to the house, and also one or two other brethren. He got a manuscript copy of the Book of Mormon, and brought it into the room where we were standing, and said: “I will examine to see if it is all here,” and as he did so I stood near him, at his left side, and saw distinctly the writing, as he turned up the pages until he hastily went through the book and satisfied himself that it was all there, when he said: “I have [had] trouble enough with this thing,” which remark struck me with amasement, as I looked upon it as a sacred treasure. It was written on foolscap paper, and formed a package, as the sheets lay flat, of about two or two and a half inches thick, I should judge. It was written mostly in Oliver Cowdery’s handwriting, with which I was intimately acquainted, having set many pages of type from his handwriting, in the church printing office at Kirtland, Ohio. Some parts of it were written in other handwriting. He took the manuscript and deposited it in the corner stone of the Nauvoo House, together with other papers and things, including different pieces of United States’ coin. I put in some copies of the Times and Seasons; all were carefully encased in sheet lead to protect the contents from moisture, and a stone had been cut to closely fit into the cavity which had been made in the corner stone to receive these things, which stone was fitted in its place and cemented, when it was thought the papers and other articles would be preserved without decay or injury for ages, if not disturbed. From this circumstance we know there must have been at least two manuscript copies of the Book of Mormon, which necesssarily must have been the case, as the printer who printed the first edition of the book had to have a copy, as they would not put the original copy into his hands for fear of it being altered. This accounts for David Whitmer having a copy and Joseph Smith having one. They were both mostly written in Oliver Cowdery’s hand writing, as I have seen both. He was scribe for Joseph most of the time he was translating the Book of Mormon. (Ebeneezer Robinson, The Return, Vol. 2, No. 8, August, 1890, pp. 314-315, online here, accessed August 20, 2013, bolded italics mine). Unfortunately, these two statements do not agree, for Foote and Robinson say nothing about Joseph having trouble preserving the manuscript or that he wanted to “deliver it up to the Lord”. Brown’s statement was written in a letter to John Taylor on December 20, 1879 and seems to want to interpret the event in a different, or more faith promoting light. If Joseph had actually placed the manuscript in the cornerstone of the Nauvoo house with the intention of simply “delivering it up to the Lord” to preserve it, Ebeneezer Robinson’s account surely would have reflected this, as would Warren Foote’s journal entry for that date. One also wonders why Joseph could not have simply given it to an angel to “preserve”, as he claimed to have done with the gold plates. (See, Joseph Fielding Smith, Essentials In Church History, p. 68). Orasmus Turner, History of Pioneer Settlement of Phelps And Gorham’s Purchase, 1849, page 215. “Cracking the Muisca Calendar”, online here, accessed, August 25, 2013. See also, Manuel Arturo Izquierdo Pe~na, “The Muisca Calendar: An approximation to the timekeeping system of the ancient native people of the northeastern Andes of Colombia,” Dissertation presented to the Departament d’Anthropologie, Faculte des etudes superierures, Universite de Montreal, as prerequisite to obtain the diploma of Maitre es Sciences en Anthropologie, v. 3, 2008. Online here, accessed August 25, 2013.
 ibid, pp. 28-29. These are the Hieroglyphs given in Humboldt’s Researches Concerning The Institutions & Monuments of The Ancient Inhabitants of America, published in 1814. Times and Seasons 3, no. 16, June 15, 1842, 818–20, See also, “An Analysis of Joseph Smith’s Statements Associated with the Origins of the Aztecs in the Country of Aztlan”, by Ted Dee Stoddard, Online here, accessed, August 25, 2013. D. Michael Quinn, Early Mormonism and the Magic World View, Chapter 4. An excerpt from this book may be found here, accessed, August 30, 2013. Lucy Harris (?-c. 1841), oldest daughter of Martin and Lucy Harris, was evidently born in Palmyra, New York. She married Flanders Dyke, probably in the late 1820s. She had seven children (Utah Genealogical and Historical Magazine 26 [July 1935]: 108). There are four possible instances of the dash like character that appear in the first four lines, but they all appear to be part of another character (except perhaps No. 2), not “stand alone” characters. I include them here for study. One interesting, and possibly very meaningful, detail about the RLDS transcript is the word “Charactors” written across the top. Four students of early Church history, R.D. Webb, Ariel Crowley, Dean Jessee of the LDS Church Historian’s Office, and the anti-Mormon writer, I. Woodbridge Riley, think that this word is in the hand of Joseph Smith. If so, the authenticity of the RLDS transcript would be strengthened greatly. (Stanley B. Kimball, “The Anthon Transcript: People, Primary Sources, and Problems,” B.Y.U. Studies, Vol. 10, No. 3, Spring, 1970, p. 349). The Geneva Gazette, March 9, 1825. Anne [Anna] Schott was probably born at Fayette, Seneca, New York about 1804. She was the daughter of Frederick Schott and his wife Anne. They had moved from the vicinity of Harrisburg, Pennsylvania in 1802 to Fayette. 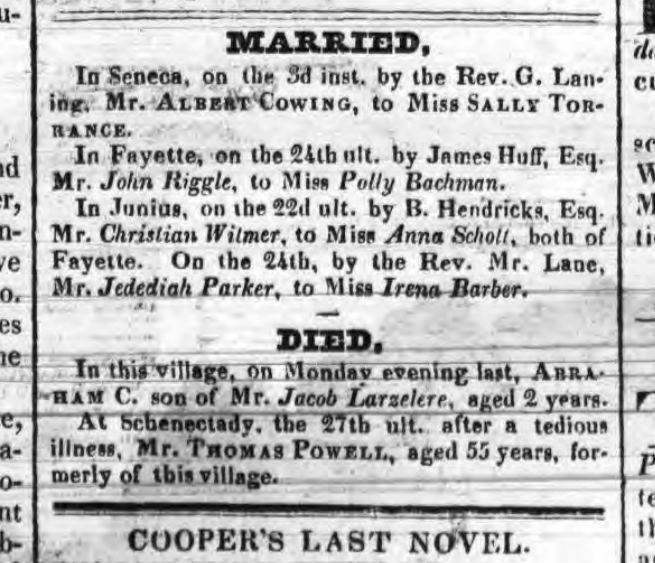 Anne married Christian Whitmer on 22 Feb 1825 in Seneca County. Anne was baptized on 11 Apr 1830 at Seneca Lake by Oliver Cowdery, along with her husband. Moved to Ohio and then Missouri in 1831, settling in Jackson County. From there the couple moved to Clay County where Anne’s husband died 27 Nov 1835. After this Anne returned to New York to live with her parents. She married Francis Hulett, but later divorced him. She died in Seneca County, New York. There is no indication in any records of any children being born to Anne and Christian. 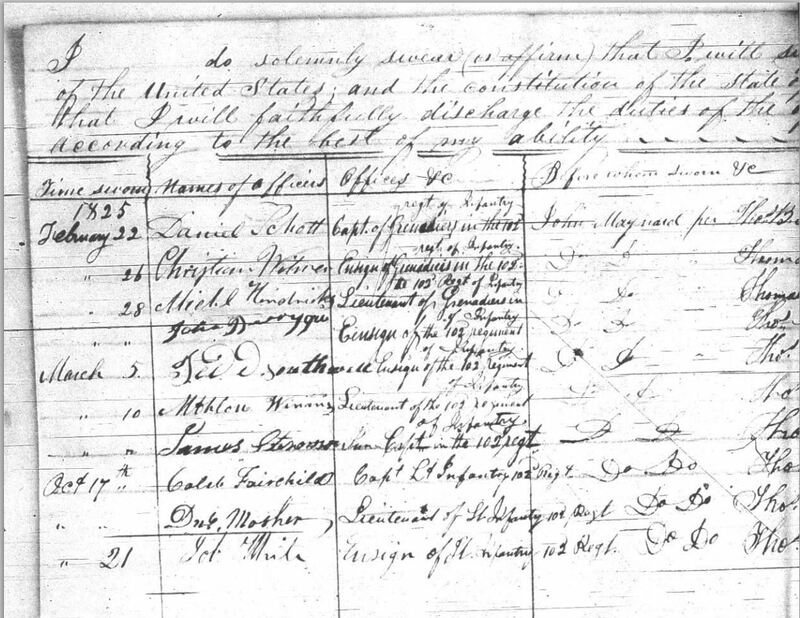 (Lyman D. Platt, “Members of th Church of Jesus Christ of Latter-Day Saints baptized by September 26, 1830,” (PDF) p. 23, Online here, accessed August 20, 2013. At the time of Christian Whitmer’s marriage, he was spelling his name “Witmer” without the “h”. I am grateful to Brent Metcalfe who informed me that he has seen the signature of Christian’s grandfather and that he also spelled his last name without the “h”. I discovered the marriage notice of Christian and Anna Witmer while doing research for this article. The Seneca Farmer, March 23, 1825. “Report of Elders Orson Pratt and Joseph F. Smith, Millennial Star 40 (9 Dec 1878):771-7. Kansas City Daily Journal, June 5, 1881. Chicago Tribune, 15 Dec 1885. David Whitmer, An Address to All Believers in Christ, p.33. Dan Vogel, Early Mormon Documents Vol. 1, p. 99. The Three Witnesses to the Book of Mormon were also involved in folk magic. Oliver Cowdery was a rodsman before he met Smith in 1829 and was soon authorized by divine revelation to continue the revelatory use of his “rod of nature.” David Whitmer revered Smith’s use of a seer stone, may have possessed one of his own, and authorized a later spokesman for his own religious organization to obtain revelations through a stone (figs. 11-12). Martin Harris endorsed Smith’s use of a seer stone for divination and treasure seeking, and participated in treasure digging himself after the discovery of the gold plates. Of the remaining Eight Witnesses, John Whitmer possessed a seer stone which his descendants preserved (fig. 13), his brothers Christian, Jacob, and Peter were included in their pastor’s accusation of magic belief, and Hiram Page, their brother-in-law, had a stone for revelations. The influence of magic was equally pervasive among the twelve men [p.195] who comprised the first quorum of apostles in 1835. As will be seen, almost half of the first apostles—Brigham Young, Heber C. Kimball, Orson Hyde, Luke S. Johnson, and Orson Pratt—gave specific evidence of a belief in various magical practices, while William Smith, Parley P. Pratt, and Lyman E. Johnson may have shared the views that their brothers expressed and implemented. Thus, at least two-thirds of Mormonism’s first apostles may have had some affinity for magic. (D. Michael Quinn, Early Mormonism and the Magic World View, pp. 194-195). “Wherefore it shall come to pass, that if you behold a spirit manifested that you cannot understand, and you receive not that spirit, ye shall ask of the Father in the name of Jesus, and if he give not unto you that spirit, that you may know that it is not of God: and it shall be given unto you power over that spirit, and you shall proclaim against that spirit with a loud voice, that it is not of God; not with railing accusation, that ye be not overcome; neither with boasting, nor rejoicing, lest you be seized therewith,” and refers to Hiram Page who began to get revelations through the medium of a black stone, certain characters appearing on that stone which he wrote down. “At length our Conference assembled. 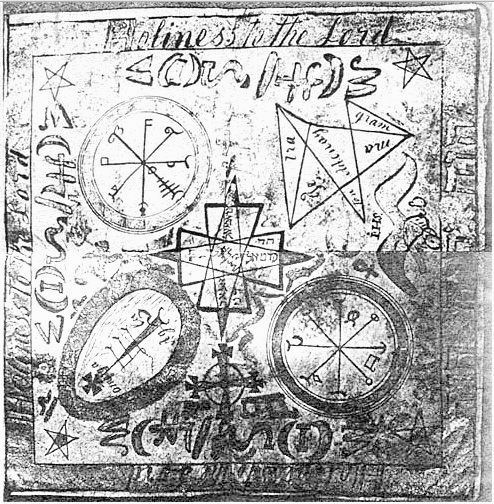 The subject of the stone previously mentioned, was discussed, and after considerable investigation, brother Page, as well as the whole Church who were present, renounced the said stone, and all things connected therewith, much to our mutual satisfaction and happiness.” (Journal of Discourses Vol. 11, p.3, November 15, 1864). …the Apostle said we have to fight against principalities and powers in high places. Bro. Hiram Page dug out of the earth a black stone [and] put it in his pocket. When he got home, he looked at it. It contained a sentence on paper to befit it. As soon as he wrote one sentence, another sentence came on the stone, until he wrote 16 pages. Bro. Joseph was told of the fact. One person asked Joseph if it is right. He said he did not know, but he prayed and got revelation that the stone was of the devil. Then it was broke to powder and the writings burnt. It was a work of the power of darkness. Amen.” (Emer Harris statement, 6 Apr. 1856, Utah Stake general minutes, archives, Historical Department of the Church of Jesus Christ of Latter-day Saints, Salt Lake City, Utah). In this instance, Smith’s move away from instruments of folk magic as church president contributed to the apostasy of early Mormon folk believers. Members of the Whitmer family were so devoted to the importance of seer stones that David Whitmer, John Whitmer, and Hiram Page later dated the beginning of ,their own disenchantment with Mormonism at the time when Joseph Smith stopped using the seer stone as an instrument of revelation. (D. Michael Quinn, Early Mormonism and the Magic World View, p.201). For more on Page’s stone see “Hiram Page’s Seer Stone and Checking Your Sources,” found here, accessed August 20, 2013. Shortly after we had received the above revelations, Oliver Cowdery returned to Mr. Whitmer’s, and I began to arrange and copy the revelations which we had received from time to time; in which I was assisted by John Whitmer, who now resided with me. Whilst thus (and otherwise at intervals) employed in the work appointed me, by my heavenly father, I received a letter from Oliver Cowdery, the contents of which gave me both sorrow and uneasiness. Not having that letter now in my possession, I cannot, of course, give it here in full, but merely an extract of the most prominent parts, which I can yet, and expect long to remember. He wrote to inform me that he had discovered an error in one of the commandments: Book of Doctrine and Covenants, Sect. 2d, page 7th-“And truly manifested by their works that they have received of the Spirit of Christ unto the remission of sins.” The above quotation, he said, was erroneous, and added, I command you in the name of God to erase these words, that no priestcraft be amongst us!! I immediately wrote to him in reply, in which I asked him by what authority he took upon him to command me to alter or erase, to add or diminish to or from a revelation or commandment from Almighty God. In a few days afterwards I visited him and Mr. Whitmer’s family, were I found the family, in general, of his opinion concerning the words above quoted; and it was not without both labor and perseverence that I could prevail with any of them to reason calmly on the subject. However Christian Whitmer at length got convinced that it was reasonable, and according to Scripture, and, finally, with his assistance, I succeded in bringing, not only the Whitmer family, but also Oliver Cowdery, to acknowledge they had been in error, and that the sentence in dispute was in accordance with the rest of the commandments. And thus was their error rooted out, which having its rise in presumption and rash judgment, was the more particularly calculated (when once fairly understood) to teach each and all of us the necessity of humility and meekness before the Lord, that he might teach us of his ways, that we might walk in his paths, and live by every word that proceedeth forth from his mouth. I soon arrived at the [Smith] house, and found Hyrum walking the floor; as I entered the room, I said peace be to this house; he looked at me and said “I hope it will be peace.” I then said is there any one here that believes in visions and revelations. He [Hyrum] said yes, we are a visionary house. I then said I will give you one of my pamphlets, (which was visionary and of my own composition). . . . They then called the people together, which consisted of five or six men who were out at the door. Father Smith was one and some of the Whitmer’s. They then sat down and read my pamphlet. Hyrum read first, but was so affected he could not read it, He then gave it to a man, which I learned was Christian Whitmer, he finished reading it. I then opened my mouth and began to preach to them, in the words that the angel had made known to me in the vision, that all Churches and Denominations on the earth had become corrupt, and [that] no Church of God [was] on earth but that he would shortly raise up a Church, that would never be confounded nor brought down and be like unto the Apostolic Church. They wondered greatly who had been telling me these things, for said they we have the same things wrote down in our house, taken from the Gold record, that you are preaching to us. (Marquardt & Walters, Inventing Mormonism, Ch.6, p.129). This incident would probably have made a strong impression on Christian Whitmer and may have helped him overcome any doubts raised about Joseph Smith by others. The change in this revelation is of great importance; the word “them” refers to the plates–the Book of Mormon: We were commanded to rely upon it in building up the church; that is, in establishing the doctrine, the order of offices, etc. : “FOR IN THEM ARE ALL THINGS WRITTEN CONCERNING MY CHURCH, my gospel, and my rock.” But this revelation has been changed by man to mean as follows: That therein is not all things written concerning the church, but only all things concerning “the foundation of” the church–or the beginning of the church: that you must build up the church, beginning according to the written word, and add new offices, new ordinances, and new doctrines as I (the Lord) reveal them to you from year to year: As a Seer to the Church; High Priests; Three of the First Presidency; Baptism for the Dead; Polygamy, etc., etc. When the Book of Doctrine and Convenants was compiled in 1834, the church had then received many revelations to establish new offices and doctrines that are not even mentioned in the New Convenant of either of the two sacred books. They changed this revelation in order to sustain these new doctrines: If they had not made this change, the plain language of the original revelation would have condemned the Book of Doctrine and Covenants. I want to repeat that I was present when Brother Joseph received this revelation through the stone: I am one of the persons to whom it was given, therefore I know of a surety that it was changed when printed in the Doctrine and Convenants in 1834. Likewise concerning all these changes of which I will speak, I know that these changes were made. I was present when nearly all the early revelations were received. There are several of the old Books of Commandments yet in the land; bring them to light and see for yourselves that these revelations were changed just as I tell you. These changes were made by the leaders of the church, who had drifted into error and spiritual blindness. Through the influence of Sydney Rigdon, Brother Joseph was led on and on into receiving revelations every year, to establish offices and doctrines which are not even mentioned in the teachings of Christ in the written word. In a few years they had gone away ahead of the written word, so that they had to change these revelations, as you will understand when I have finished. (David Whitmer, An Address to All Believers in Christ, p.58-59). The Latter-day Saints’ Messenger and Advocate, Vol.2, No.3, December, 1835, p.240. The reason I bring this up, is that I feel it is a weak spot in my analysis. John Whitmer also had misspellings, but not near as many as Christian Whitmer did. When Joseph Smith initially misspelled the word characters in his 1832 Summer History, he did not do so with an “o” in it. He merely left out the “h”. Now, it is possible that by 1832 his spelling had improved, and that he may have had problems misspelling the word. But this is not definitive proof, and my conclusion that it is John Whitmer who wrote the word “Caractors” depends on him copying a misspelling, which even I have problems with, given that John corrected Christians rendering of the Cover Title (JST 185). But the handwriting analysis to me, still weighs in the favor of John Whitmer for the word “Caractors” and Christian Whitmer for the Cover Title. Mormon Historical Studies, Vol. 14, No. 1, Spring 2013, p. 138. I would like to thank Don Bradley for his help with this, and his encouragement and interest in this project. Even though I have great confidence in Brent and Erin Metcalfe’s research and conclusions, I am still troubled by the obvious differences in those style characteristics. The word “Caractors” and the fact that it is misspelled seem to point towards Christian Whitmer, yet the style of writing seems to point to his brother John. One possible explanation may be that there was an original document with that spelling on it penned by Joseph Smith himself, and John Whitmer wanted to preserve the original as it was written (which I’m not entirely convinced of, but have no better explanation at this time). If Christian penned the entire “Caractors” document, why would John not have his brother write it out first and spell check it (if he did not want to preserve an original spelling of the word that way), when he went to the trouble to do so with the Cover Title? If the whole document was indeed penned by Christian Whitmer at the same time, then why is the word “Caractors” not included with the Cover Title on JST185? The identification of D&C 38 was related by H. Michael Marquardt to Dan Vogel, who gave me this information in an Email on July 22, 2013. For more on Edward Partridge, see D. Brent Collette, “In Search of Zion: A Description of Early Mormon Millennial Utopianism as Revealed Through the Life of Edward Partridge.” M.A., Brigham Young University, 1977, Online here, accessed August 20, 2013. In August 1831 Joseph Smith and a group of Mormon converts originally from Colesville, New York, met near Independence, Jackson County, Missouri, to lay the foundation for an American Zion. Designated as a place of refuge where church members could escape the tribulations preceding Jesus Christ’s second coming, Jackson County was to be the location of a communitarian enterprise called The Law of Consecration and Stewardship or the United Order of Enoch and as a site for a temple for the most sacred rites associated with Mormon worship. (Thomas G. Alexander, Things in Heaven and Earth, The Life and Times of Wilford Woodruff, a Mormon Prophet, p.26). In a blessing to his eldest son, George A., on September 20, 1853, he promised that “all the inhabitants of the earth shall know that the Lord did choose the Smith family to build up Zion & did by them lay the foundation of this Church which shall never be overthrown neither shall the name of the Smith family be blotted out under Heaven.” (Irene M. Bates, E. Gary Smith, Lost Legacy: The Mormon Office of Presiding Patriarch, p.117). I hereby give a copy of the proceedings of the laying of the first logs of the City of Zion. As written by Oliver Cowdery. “After many struggles and afflictions, being persecuted by our enemies, we received inteligence by letter from our brethren, who were at the East. That br[others] Joseph and Sidney, and many others elders, were commanded to take their journey to this land, the Land of Missouri. Which was promised unto us should be the land of the inheritance of the Saints, and the place of the gathering in these last days. Which inteligenc cheered our hearts, and caused us to rejoice exceedingly. And by the special direction protection of the Lord, br Joseph Smith Jr. and Sidney Rigdon, in company with eight other elders, with the church from Colesville New York, consisting of about sixty souls, arivd in the month of July and by Revelation the place was made known where the Temple shall stand, and the City should commence. And by commandment twelve of us assembled ourselves together Viz. Elder Joseph Smith Jr. the Seer, Oliver Cowdery, Sidney Rigdon, Newel Knight,4 William W. Phelps, and Ezra Booth who denied the faith. On the second day of August 1831, Brother Sidny [p. 32] Rigdon stood up and asked saying: Do you receive this land for the land of your inheritance with thankful hearts from the Lord? answer from all we do, Do you pledge yourselves to keep the laws of God on this land, which you have never have kept in your own land? We do. Do you pledge yourselves to see that others of your brethren, who shall come hither do keep the laws of God? We do. After prayer he arose and said, I now pronounce this land consecrated and dedicated to the Lord for a possession and inheritance for the Saints, (in the name of Jesus Christ having authority from him.) And for all the faithful Servants of the Lord to the rimotest ages of time Amen. The day following eight Elders viz. Joseph Smith Jr., Oliver Cowdery, Sidney Rigdon, Peter Whitmer Jr., Frederick G. Williams,6 Wm. W. Phelps, Martin Harris, and Joseph Coe. assembled together where the temple is to be erected. Sidney Rigdon dedicated the ground where the city is to Stand: and Joseph Smith Jr. laid a stone at the North east corner of the contemplated Temple in the name of the Lord Jesus of Nazareth. After all present had rendered thanks to the great ruler of the universe. Sidney Rigdon pronounced this Spot of ground wholy dedicated unto the Lord forever: Amen. Some of the Elders who travelled to the land of Missouri and preached by the way tarried here in this land, among whom is the Bishop E[dward] Partridge[,] Isaac Morley[,] and John Corrill. Some were sick on their way to this land but all were restored to health[.] among those who were sick was John Murdock Parley P. Pratt and Thomas B. Marsh—They all tarried until after they attended a conference in this land. They have since all gone to preach [p. 33] the gospel and call sinners to repentance. There were some churches built by the way as they journeyed to this land (Mo.) and the people were warned of the danger they were in, if they did not repent. Shortly after Joseph Smith Jr[,] Oliver Cowdery[,] and Sidney Rigdon Returned [to Ohio] Sidney wrote a discription and an epistle according to commandment.13 And Oliver Cowdery and Newel K. Whitney14—were commanded to go and visit the churches speedily—as you will see by reading the Revelation given August thirty at Kirtland15— The following is a copy of the Epistle written by S. Rigdons own hand. I sidney a servant of Jesus Christ by the will of God the Father and through the faith of our Lord Jesus Christ unto the Saints who are scattered abroad in the last days, may grace [p. 34] mer[c]y and peace, rest upon you from God the father and from our Lord Jesus Christ, who is greatly to be feared, among his saints and to be had in reverance of all them who obey him. But by reason of their wickedness and rebellion against him and wicked and unbelieving hearts the Lord withdrew his spirit from them, and gives them up to work all uncleanness with greediness, and to bring swift destruction on themselves—[p. 35] and through their wickedness to hasten the day of their calamity, that they may be left without excuse in the day of vengeance. But it has pleased our heavenly Father to make known some better things, concerning his Saints and those who serve him in f[e]ar and rejoice in meekness, before him, even things which pertain to life everlasting, for godliness has the life promise of the life, that now is, and that which is to come; Even so it has pleased our heavenly Father to make provisions for his saints in these last days of tribulation that they through faith and patience, and by continuing in well doing may preserve their lives; and attain unto rest and endless felicity—but by no other means, than that of a strict observance of his commandments and teachings in all things as there is and can be no ruler nor lawgiver in the Kingdom of God save it be God our Saviour himself—and before him he requires that all his saints & those who have named the name of Jesus, should be carful to depart from iniquity—and serve him with fe[a]r and rejoicing and trembling least he be angry and they perish from their way. According to the prediction of the ancient profits that the Lord would send his messengers in the last days, and gather his elect. (which is the elect according to the covenant, viz. those who like Abraham are faithful to God and the word of his Grace.) from the four winds even from one end of the earth to the other as testified of by the Savior himself—so in these last days he has commenced to gather together, into a place provided before of God and had in reserve in days of old, being kept by the power and providence of of God, for this purpose and which he now holds in his own hands, that they through faith, and patience may inherit the blessings promises—A land which God by his own [p. 36] commandment has consecrated to him self where he has said, that his laws shall be kept, and where his saints can dwell in safety, through their perseverance in well doing and their unfeigned repentance of all their sins, our heavenly Father has provided this land himself because it was the one which was [best] adapted, for his children, where Jew and Gentile might dwell together: for God has the same respect to all those who call upon him in truth and righteousness whether they be Jew or Gentile; for there is no respect of persons with him. This land being situated in the center of the continent on which we dwell with an exceeding fertile soil and ready cleared for the hand of the cultivator bespeaks the goodness of our God, in providing so goodly a heritage, and its climate suited [to] persons from every quarter of this continent. wither East West North or South yea I think I may say, for all constitutions from every part of the world and its productions nearly all varieties of both grain and vegitables which are common in this country together with all means, [for] clothing: in addition to this it abounds with fountains of pure water[,] the soil climate and surface all adapted to health[.] indeed I may say that the whole properties of the country invite the Saints to come and partake their blessings[.] but what more need I say about a country. which our Heavenly Father holds in his own hands[,] for if it were unhealthy he could make it healthy and if barren he could make it fruitful. Such is the land which God has provided for us, in these last days for an inheritance, and truly it is a goodly land, and none other as well suited for all the saints as this and all those who have faith and confidence in God who has ever seen this land will bear the same testimony. In order that you may understand the will of God respecting this land and the way and means [p. 37] of possessing it, I can only refer you to commandments which the Lord has delivered by the mouth of his Prophet which will be read, to you, by our brethren Oliver Cowdry and Newel K. Whitney whom the Lord has appointed, to visit the churches and obtain means for purchasing this land of our inheritance that we may escape in the day of tribulation which is coming on the earth. I conclude by exhorting you to hear the voice of the Lord your God, who is speaking to you in much mercy and who is sending forth, his word and his revelation in these last days, in order that we may escape impending vengeance; and the Judgements which await this generation, and which will speedily overtake them—Brethren pray for me, that I may be counted worthy to obtain an inheritance in the land of Zion and to over come, the World through faith, and dwell with the sanctified, forever, and ever Amen. Written at Kirtland Ohio Aug. 31, 1831. (Bruce N. Westergren, From Historian to Dissident:The Book of John Whitmer, pp. 86-91). For a debunking of the Mormon myth that Symonds Ryder left the church simply because of a misspelling of his name in a “revelation” dictated by Joseph Smith, see “Symonds Ryder and a Crisis of Faith,” found online here, at the Mormon Matters Blog. I will have more on this subject in an upcoming article scheduled for publication in 2014. A. S. Hayden, Early History of the Disciples In the Western Reserve, Ohio, (Cincinnati: Chase & Hall Publishers, 1876), pp. 220-221. Online here, accessed August 20, 2013. Scott H. Faulring, “An Examination of the 1829 ‘Articles of the Church of Christ’ in Relation to Section 20 of the Doctrine and Covenants”, B.Y.U. Studies 43, No. 4, (2004) pg. 76. Faulring’s scenario that Ryder somehow accessed Church records in Kirtland and stole a few “revelations” is a tenuous allegation. And again, verily I say unto you, let my servant William W. Phelps be planted in this place, and be established as a printer unto the church. And lo, if the world receive his writings—behold here is wisdom—let him obtain whatsoever he can obtain in righteousness, for the good of the saints. And let my servant Oliver Cowdery assist him, even as I have commanded, in whatsoever place I shall appoint unto him, to copy, and to correct, and select, that all things may be right before me, as it shall be proved by the Spirit through him. (Revelation, 20 July 1831, in 1835 Doctrine and Covenants Section 27:5). Also during the summer of 1831 “Edward Partridge purchased a lot near the center of town upon which the building that likely became the printing office already stood”. (The JSP Website, see also, Berrett, LaMar C., ed. Sacred Places: A Comprehensive Guide to Early LDS Historical Sites. 6 vols. Salt Lake City: Deseret Book, 1999–2007, 4:51–52). Since Kirtland was to be a temporary refuge for the church until the move to Missouri as attested to by many statements from the period, and the “revelations” were soon to be published there, it is entirely feasible that Smith carried them with him to Missouri, and that some were inadvertently left unattended for a time, (or left behind as Ryder thought) giving Ezra Booth the opportunity to read them and take several of them. Those “followers” were mostly immigrants from the New York Colesville Branch of the Church, who were promised by Smith that they could settle on land owned by Elder Lemon Copely, who, when they arrived in Thompson refused to settle them on his land. It is of interest to note that if Symonds Ryder had stolen the “revelations” he had in his possession sometime after the leadership of the church left for Missouri in June of 1831, why did he then wait until the fall, when Ezra Booth had returned from Missouri, to have them published? In the very next issue of the Telegraph, Howe publishes Booth’s first letter to the Reverend Ira Eddy. They believe, according to the Book: “That a day of great wrath, is bursting upon all the kindred, of the earth; and that in Mount Zion, and in Jerusalem, alone, shall be deliverance in that day,”(even in the land, which the Lord Jesus had given to them, for a dwelling-place, and an everlasting possession). The place where they then had their stay, was not the “Land of Promise;” – but that, lay, on the western boundary of the State of Missouri; In which place, they were then assembling; and where they believed, In process of time, they should have a temple; and a city, of great magnificence, and wealth; and that shortly, they should increase, and tread down all their enemies, and bruise them beneath their feet. After which period, Christ Jesus should descend and reign with them, personally one thousand years upon the earth. And then their enemies should be loosed for a season; (or, as one said to me, for the space of three months,) when, — should take place, the General Judgment; and the “final consummation of all things.” (Anna Nancy Towle, Vicissitudes Illustrated, Charleston, 1832, p. 153. (2nd Edition, 1833). By 1832 the Mormons were preaching that they, “should never die, but be translated, after the manner of Enoch, and that in eighteen months Mormonism would be the prevailing religion; and, that in five years the wicked were to be swept from the face of the earth.” (The Liberal Advocate, April 14, 1832). Among the wonders of the present day, you may record the following. Many of the people called Mormons, have arrived at this place, and it is said, more are on the way. The condition of those that are here, must be very unpleasant, and their sufferings are, in no small degree, from the want of comfortable houses, and something on which to subsist. Their settlement extends to the West line of Missouri State, two miles and a half from this place; they manifest a disposition to, and no doubt soon would, go among the Indians, were they permitted; which by the way is not the case. They call this place the Mount Zion, or New Jerusalem, so often spoken of in Scripture; — though it is not more elevated than the common face of the country, nor yet is there in it any thing strange or peculiarly prepossessing in its favor, more than any other portion of the West. Here, they tell us, will be gathered the Gentiles from the east, and the Jews (the Indians) from the west, to their temple, which shall subsequently be built on the very spot now selected by them, to which, they say, their God will come in person, destroying all who shall be so daringly wicked, as to reject their Gospel; when Christ comes, which at most will not be more than fifteen years, he will bring all the Apostles, and old saints, and will reign with them here a thousand years; during this reign, the rest of the dead, shall not live (that is, all who are not Mormons,) for this is the first resurrection. To support the idea of their Christ suddenly coming to their temple, to purify and refine them, they read Malachi, 3d chapter to the 6th verse inclusive, with other Scriptures found in Zephaniah, Zechariah, and elsewhere, all of which refer to the coming of Christ. They have a revelation of their own, which, they affirm. was given to the people of this continent, (the Indians,) on plates and deposited in the earth and kept concealed in the earth of the Lord, till the fulfilment of its time, which has now been accomplished; and to prove that Joseph Smith is that wonderful prophet, to whom these marvelous plates and their profound mysteries should be revealed, they recite the 29th chapter of Isaiah, saying that the prophet Smith is that unlearned man, to whom the book was given, to read, and he said I cannot, for I am not learned! But this difficulty was soon removed by the spirit which came upon him, and blest him with the gift of tongues. The Book then was clearly opened to his understanding, and he translated it to one of the witnesses, who wrote it in our language. Thus according to the 37th chapter of Ezekiel, say they, the sticks there spoken of, (the Mormon book and our Bible,) are become one, in the hand of the prophet Smith; or shall, when our Bible shall be rightly translated by him, under the outpouring of his holy spirit, and its directions. Every person, who tells them that he wishes to forsake sin, is, without further ceremony, taken by the Elder, and baptized for the remission of his sins; he is now told that he shall soon receive the spirit; this being accomplished, the Elder lays his hands on him, and imparts to him his holy spirit, which they say they then feel immediately, and know that it is the truth. The Elder now sings to the new converts, consecrating songs of their own diction, (composing,) and to them he reads prophecies about giving their possessions to the Lord’s store, which if they fail to do, they forfeit the fellowship of the fraternity, nor will they long be considered worthy members with them. When their property is thus laid at the Bishop’s feet, he places it in the store, and they lose sight of it forever; their store-keeper will not trust them for a single dollar, though he willingly gives credit to others. If the brotherhood is once taken, and any should choose to leave them, he must go out empty, however much he had deposited in the Treasury. Much is said among them about the Holy Ghost being given, by the laying on of the Elder’s hand, about prophecying, healing the sick, and the interpretation of tongues; all this however they carefully avoid, saying that these things can only be done, when they are in the spirit, which perhaps but seldom happens in this land of pilgrims; since no miracles have been done here at any time by them, though greatly needed, and they have been abundantly pressed to it. They eat, they drink, are sick, and die, as all others do. When they are sick, unfortunately, they have not faith to be healed. Of the dying they say, their work is done, they must go: they also say, it is self-evident that disease is the natural effect of unbelief. If this be true, I am sure, their faith cannot be as large as a mustard seed, for none are more liable to sickness, and all contagions than themselves, the cholera not excepted, even among their preachers. Perhaps when their Christ comes, and brings their old Apostles and saints, some of them may profess more power and faith than these, that are already here; if this should not be so, I shall finally despair of seeing miracles done by them. Although they have prophesied, the graves have not yet opened: the bones are yet dry, nor are they yet collecting; we have heard no voice in the valley; we know some have professed, but nothing is moved; if others have spoken to the winds they have not obeyed them; there are no symptoms of life among the slain, all these things continue, just as they were. Once again we see a contemporary account that the Mormons were preaching that only in “Zion” or Missouri would anyone be safe, and that the destruction of the wicked would occur “in not more than fifteen years” from that time. Also, we see the writings of Isaiah and Ezekiel being used to support the coming forth of the Book of Mormon. Mormon Historical Studies, Vol. 14, No. 1, Spring 2013, p. 145. A biography of George Edward “Ed” Anderson may be found here, as well as a link to his diaries. A short biography of Julia Ann Whitmer Schweich may be found here. George Edward Anderson Diary, May 12, 1907, Sunday, Richmond, pg. 32, online here, accessed August 25. 2013. Julia may have been mistaken about her grandfather’s age. I believe that Hicks took the photo in 1882, not 1886 and that Julia confused the year with her grandfather’s age. (She was recalling an event which happened over 20 years past). Since Whitmer was born in 1805, he would have been 77 years old in 1882. This is Brent Metcalfe’s theory, and it has a sold basis, for the “Caractors” document was most certainly cut before 1884 and so would have to have been photographed before that time. Brent has communicated to me that he is trying to find the bank records that would show when the safe where the documents were kept was accessed, and this would bolster this theory, especially if there is a description of the documents that were kept there. If Hicks did indeed take the later photo of David Whitmer in 1886, it does not preclude him (or John) from having had the “Caractors” document photographed at an earlier time, say between 1867 (when Hicks first photographed David Whitmer) and 1884 (for by 1884 we have accounts that prove it was cut). Even though his Proclamation does not reveal anything about the document, we know that Whitmer had it “in his possession” by 1881, and that it had been removed from the safe where it was kept by Van Cleave sometime between 1878 and 1881. Hicks lived about 25 miles from Richmond, which was not that long of a journey to make for whatever reason, even to photograph a document, but it would have been much more convenient to have both done at the same time and this is the more likely scenario. See Note above. For the size of the document, see the Improvement Era, Vol. 14, No. 1, January, 1842. Daily Missouri Republican, 16 July, 1884. John Whitmer’s papers were deposited in a Richmond, Missouri, bank vault. But Van Cleave was ultimately unable to compile his book, and Whitmer’s papers next passed to George Schweich (fig. 4)—Van Cleave’s brotherin-law and David Whitmer’s grandson. In 1903, when Schweich sold the printer’s manuscript of the Book of Mormon and “Caractors” document, four leaves of BCR materials also passed to the RLDS Church. Brent Metcalfe has shared with me that he believes that the “Caractors” document was among those that Van Cleave was given by John Whitmer’s daughter who then placed them in a Richmond bank vault. Sometime after this David Whitmer removed the document from the vault and had it photographed by Jacob Hicks in the fall of 1880. He then cut the document so that people would not think that the English text below was a translation of the “Caractors”. David may have had the document photographed in 1880 or 1882, and further discoveries may help to determine this. The document may also have been photographed by Hicks in 1867. I do not ascribe to the theory that David cut the document to avoid confusion; but rather to bolster his story that what he possessed was the original “Anthon Transcript”. Joseph sent for me to come to Harmony to get him and Oliver and bring them to my father’s house. I did not know what to do, I was pressed with my work. I had some 20 acres to plow, so I concluded I would finish plowing and then go. I got up one morning to go to work as usual and, on going to the field, found between five and seven acres of my ground had been plowed during the night. I don’t know who did it; but it was done just as I would have done it myself, and the plow was left standing in the furrow. “Report of Elders Orson Pratt and Joseph F. Smith, Millennial Star 40 (9 Dec 1878):771-7, Online here, accessed August 25, 2013. The alternate photo of the “Caractors” may be viewed here, accessed August 25, 2013. “Martin Harris called upon Prof. Anthon, of New York, with a transcript on paper which Smith had given him of the characters on one of the golden plates. ‘This paper,’ Prof. Anthon said, in a letter dated New York, Feb. 17, 1834, ‘was in fact a singular scroll. It consisted of all kinds of crooked characters, disposed in columns, and had evidently been prepared by some person who had before him at the time a book containing various alphabets. Greek and Hebrew letters, crosses and flourishes, Roman letters, inverted or placed sideways, were arranged and placed in perpendicular columns,” etc. The “learned” could not read it, and the book was delivered to him that is not learned. I will quote two verses from the twenty-ninth chapter of Isaiah, which is the prophecy regarding this matter. If one reads the entire quote, it is hardly “favorable” to the Book of Mormon. It is obvious that the complete description of the Book of Mormon characters given by Anthon was reproduced by the American Cyclopædia, including the last part about the circle; but Whitmer conveniently leaves that part out of his account. This proves that Whitmer was well aware of Anthon’s description of the original transcript, which did not match up with the document that he was promulgating as the original, and that he left out the part of the description which would have cast doubt on his story that he had the “original transcript” taken to Charles Anthon in 1828 by Martin Harris. Whitmer also published in his Address in 1887 that he had the “Original” Book of Mormon Manuscript, knowing full well that this was not true. This creates a serious credibility issue for David Whitmer which is not answered by the theory that he cut the document simply to avoid confusion, when it would have been very easy for Whitmer to simply say the document was a copy and that the text below had nothing to do with the characters that appeared above the Cover Title. This leads me to believe that David Whitmer did not have the document photographed in 1880 or 1882, but that it was photographed much earlier, (in the 1860’s) before Whitmer had established his Church, and perhaps felt that having original documents in his possession somehow bolstered his credentials and importance.